Swine Flu - How the elderly can prevent it or monitor through home health monitoring. avoid it. conquer it. monitor it. Swine flu is the talk of the town these days. Walk into any walk-in clinic or ER and all you see are mobs of people with masks on. Swine flu has caught many off guard and right next to the flu of the season, it has knocked many people right off their feet and sadly taken many lives. Caregivers and the weak elderly patients are at high risk. Patients tend to get weaker and catch any disease that floats by! Stressed caregivers with weakened immune systems are highly vulnerable to catching what the patients now have. Some perspective on this situation - every year about 40,000 people die from the flu. In 2009 we saw under 10,000 deaths. It seems we can expect another 35,000 more just from the basic ole flu. I'm not a doctor and I'm not the CDC but sometimes knowledge can put perspective on things and help us calm down a bit. 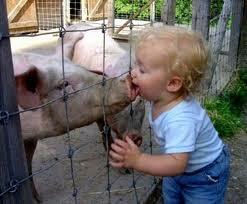 Swine flu is serious - so is any flu influenza for the right population. Any sickness can take a turn for the worse and cause devastating disability and even death. Avoiding swine flu is not rocket science - but it will require lifestyle changes. Swine Flu is swine flu - and if it hits it hits but there are many things we can do to keep our defenses up, to put our protection gear on. We each have the right and the ability to prepare ourselves to fend of disease and illness. Often, though, we have learned helplessness. I want to teach you how to unlearn that. You say you are breathing... we all are, even if barely alive. However, there are certain activities that increase the amount of oxygen your body takes in. We call this exercise (or cardio in the gym). When it comes to defending yourself against swine flu - you need to do everything you can to increase your oxygen consumption. This includes quitting smoking. Smoking damages our lungs and our body's in ways that limit oxygen exchange. Here are some ideas that we can pursue to increase the amount of oxygen in our bodies. Play with your kids - breathing deeper and quicker to keep up with them! Drink more water - H2O! For every Hydrogen, you get TWO Oxygens! All these activities can cause you to breath deeper and quicker (your body's way of getting more oxygen to provide more energy to the muscles) and thus get more oxygen into your body. More oxygen means more energy, clearer thinking and better moods and perspective on life! Among the numerous benefits of exercise, more oxygen is like sending more troops inside to fend off the enemy - swine flu - or any other flu or disease. You don't need to run for 30 minutes on a treadmill - but if you can, do it! More oxygen means more defenses! It is always advised to consult your doctor before beginning any exercise program but the idea here is to change inactivity into activity. Right next to oxygen, is your immune system... when your immune system is compromised, you are in danger. What compromises your immune system. Diet - mainly sugar in all it's processed forms - slows your immune system to a crawl. Think of your soldier defenses inside. With sugar, they all fall asleep and some die! Drugs - certain drugs can lower your immune system's ability. Age is something that we can't control but we can counter some of the lowered immunity affects of aging by working on our physical and emotional weakness and simplicity in our lives. Stress can be active or passive. Active stress is stress that you can do something about. Passive stress (all the news about swine flu) is stress that you can't do anything about - like when you go to a scary movie. Simplicity in life works towards cutting those destructive activities out of our lives and enjoying life giving peace and contentment. Diet - is often our first defense against sickness and disease. We are what we eat... not just in how we look. When we eat processed food, we eat dead food. When we eat food that has been grown and now processed and we eat it as naturally as possible, we eat live food and live food can keep us alive and fighting off anything unwanted. Disease is a terrorist attack and needs more than a few rocks thrown its way! Start eating live food. If you can't chew fruits and veggies well, purchase whole foods drinks - Boltinghouse is a good brand. Pass on the coffee... the caffeine is causing your adrenals to constantly work overtime. Additional sicknesses can kick you while you're already down. In general we are more susceptible to more disease when we are already sick. Concerted efforts of bringing in the "troops" i.e. live food, rest, and simplicity to get well and stay that way. Most drugs are aimed at attacking the attacker. Some drugs, however, lower the immune system intentionally. A good example is an organ transplant where we don't want to body to attack the "foreign" new organ. If you are lining up for an organ transplant, visit Hallelujah Acres and get your body ready for this surgery. Lack of sleep is a prime weakness for sickness and the best way for it to sneak in. Your body needs healing rest to be able to fight for it's rights! Image your army of troops in your body working hard to keep your body healthy and free from the enemy - swine flu. Those soldiers can't do their job if they don't get the rest they need. And when deep, healing rest is not gotten, we are prime suspects for any sicknesses. So, what can you do to avoid the swine flu. The following list will get you on a better track with no guarantees. However, the benefits move far beyond avoiding swine flu! Quitting smoking gives you more oxygen. More oxygen gives you more energy. More energy gives you better self-esteem and accomplishment. More accomplishment gives you the drive to simplify. More accomplishment and simplicity gives you better rest at night. And better rest at night means a happier, more productive and satisfying life. Eating intentionally can give you a better immune system. As long as your intentional eating is not at DQ and McDonald's every day or even once a week. Eating better gives you more energy. Eating better and specifically eating raw or juicing gives you better health and less disease. More energy gives you more strength to accomplish simplicity. There are so many reasons why simple fitness and intentionally better eating plan can move you towards better health and help to keep disease away. Take the simple advice given above and begin to incorporate one tip every week until it becomes second nature in your life! Swine flu is serious stuff - don't get caught with your immune system or your oxygen level down. Small steps begin any journey - start yours today!